Asus is bringing out a 'mark 2' touchscreen version of its standalone Skype videophone device later in 2009, the Taiwanese manufacturer announced this week. The Skype-certified AiGuru SV1T is the next-step forward from the company's first toe-dip into this new niche market. The Asus AiGuru SV1T features Wi-Fi (or Ethernet) connectivity, a VGA webcam, microphone, speaker and – most notably – a 7-inch 800x480 pixel touchscreen. "The touchscreen works in tandem with the standalone device's built-in webcam, speaker, microphone and Wi-Fi capabilities to let users make unlimited video calls for free to other Skype users without the need for a computer," reads Asus' release. "This latest version expands and improves upon the first generation ASUS videophone announced last year." For many that already use Skype on their PC, Mac, smartphone or laptop, the idea of a standalone videophone costing the same (if not more) as a decent netbook might seem something of a false economy. 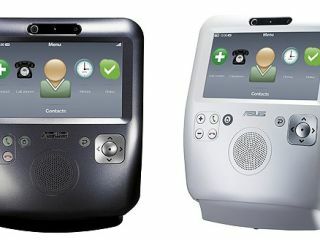 However, TechRadar can imagine the Asus AiGuru Skype videophone appealing to our parents and grandparents. Basically, anybody that is not familiar or fully comfortable with using Skype on a computer or smartphone. Asus' latest also includes improved support for conference calls and "allows users to make calls to fixed and mobile lines at really cheap rates; users can also receive calls from any land or mobile phone line if they have an online Skype number."